Learn the easier cash method of accounting in just 4-6hours. Are you behind with your bookkeeping and need to catch up so you can file your taxes! Did you try to learn accrual accounting first and your finding it difficult? You should always learn the easier cash basis method of bookkeeping first before learning the more difficult accrual method. Unique Author's Warranty allows you to email questions to help you succeed! Get your copy today and be ready for the next tax deadline! Get started instantly with our immediate download PDF book version. Printed version available here. Contractors of all types express the following sentiments. You can’t believe it happened again! Last year, you swore it would be different. You promised yourself that you would have everything ready so that this year’s tax preparation would be easy. Sure, you tried. You bought a couple of books. Tried to do the QuickBooks tutorials on their site. But you kept messing it up and having to start again. Accrual accounting is hard! What do you do if you make an incorrect transaction entry? How do you modify reports? Do you really have to reconcile your bank or credit card accounts every month? At this point, you’ve got no reliable way to track how much money is going in and out every month. There are receipts piled up everywhere. You have no idea where even to begin, and you’re so far behind you don’t even want to try. So, you end up doing what you did last year paying $2000 or more to hire someone to do your books for you and you STILL have to spend half a week sorting through everything so that the accountant can even make sense of it all to do the tax returns. If only you could get some tutoring like you did when you were struggling at something in school…..someone to just walk you through the process. Then, you could just learn how to use QuickBooks once and for all. Then, not only would tax time be easier… but the whole year would run more smoothly. 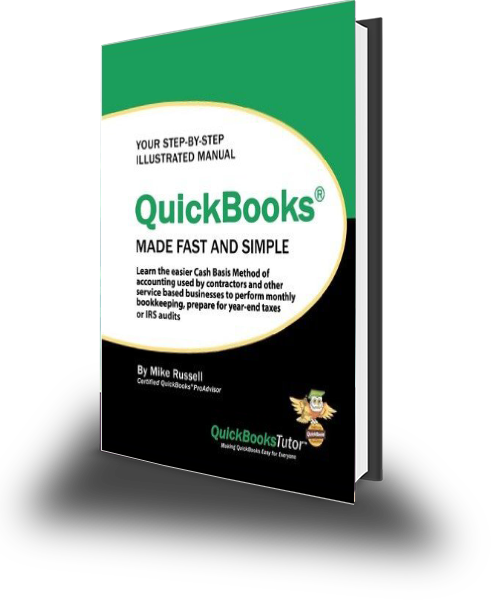 With QuickBooks Made Fast and Simple you can learn THE BEST WAY to run your business’ accounting. It’s called the Cash Method or the Cash Basis Method and is the easiest way for contractors, other service based businesses and their wives to handle their monthly bookkeeping, get ready for tax time, and, heaven forbid, prepare for an IRS audit. With the Cash Method, QuickBooks doesn’t count income until the money is actually received from your customer or client, and expenses aren’t deducted until they are actually paid. It’s the most common method in America for small businesses filing taxes and should be learned before ever attempting the more complicated accrual method. Instead, you can learn how to easily enter in the information you need, as it comes in all month long. There are easy step-by-step screenshots and practice sets in an easy to use simulation so that you can see exactly what to do every step of the way, and then practice at your own pace. PLUS, the author, QuickBooks Tutor Mike Russell offers an exclusive author’s warranty. If you’ve signed up for QuickBooks Tutor Tips (at QuickBooksTutor.com) after buying the book, but do find yourself confused after working through the exercises, you can actually e-mail the author with your question. What other book lets you do that? It’s like having your own personal tutor there, if you need him. Within a few hours you’ll have the knowledge and expertise to run your own books, saving hours of headaches and paperwork, thousands of dollars in accountant fees and the confidence to stay current in your bookkeeping year after year.